Anyone with an access to a television will have watched or be aware of Big Brother. Big Brother was created by producer John de Mol for the Netherlands and is inspired by George Orwell’s 1949 novel Nineteen Eighty-Four. The main format of the show is a group of contestants called “housemates” live in a custom-built “House” which is locked away from the outside world. The housemates are constantly watched by CCTV cameras and are required to make nominations, take part in task for shopping money and record their experiences in the Diary Room. A series normally lasts about three months during the summer but many spin-off such as Celebrity Big Brother happen in January and/or in August. Each week a housemate is voted of by the public and the last one standing wins. At this point I haven’t watched anything Big Brother related since about series 7 in the UK as from that point any thing good about the show had long gone. From the first few series being experimental and exciting to the later ones being a mad melting pot of crazy lunatics. Day #31: 2GD has said the greatest joke in history. Experts dispute these claims. Electronic Sports/Digital Sports also known as esports are becoming more popular and professional these days with games like Starcraft II, Dota 2 and Counter Strike: Global Offensive becoming big magnets for investment by sponsors and the wider gaming community. The main Dota 2 tournament “The International” is set to be one of the biggest and most lucrative in terms of prize money and scope for an esport with the prize pool currently at the $5,513,709 (now $6,826,404 which is $3,413,202 in price money) mark with two months to go until the main event. At the current rate it is destined to become bigger than some more main stream sporting events such as Snooker. The Snooker World Championships and the UEFA Champions League are good example of the differences as Mark Selby only won £300,000 while Real Madrid won €10,500,000 in prize money (These totals don’t include sponsors money). Day #41: 2GD is slowly going insane from reading the Twitch chat. GD studio for people who don’t know is an esport based business created by James ‘2GD’ Harding which aims to help “Twitch.TV, help esports and give opportunities to commentators”. They have their headquarters in Stockholm, Sweden where they live stream esport matches and behind the scenes coverage from their “Lounge” living room. 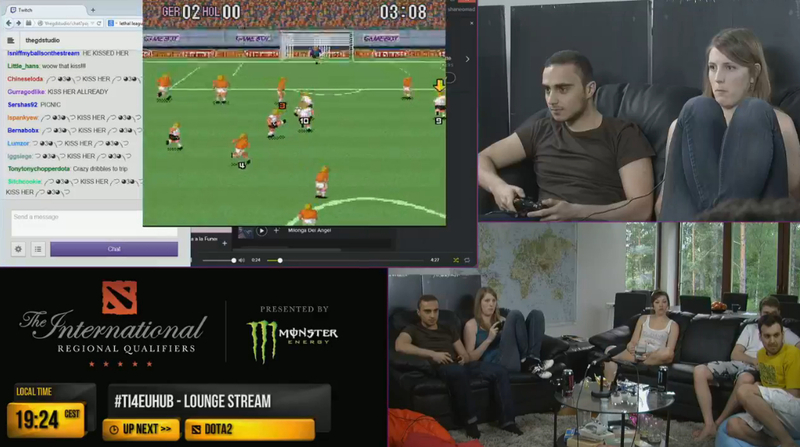 The GD Studio’s EU Hub Lounge Stream is basically bringing the glory days of Big Brother and the excitement of esports into one long endless live show. Like Big Brother, for the last two weeks you could check the live broadcast anytime of the day or night and see what they are up to. Also like the community surrounding Big Brother’s the live stream chat is completely pointless to engage with and read what they think as the streams chat just ends up being filled with rubbish speculation and outcries of people who feel they are owed something (even the subscribers) for watching a free live stream. 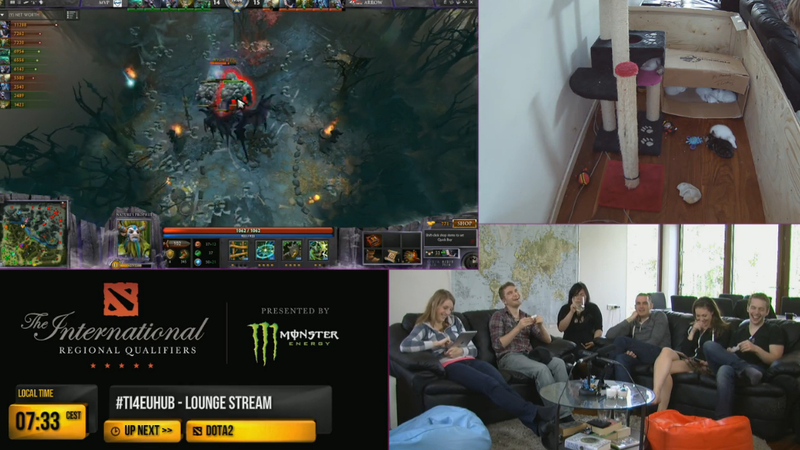 However the actual format of the Lounge Stream is like Big Brother and is strangely addictive and reassuring as you can see what the “housemates” are up to any time of the day. Day #46: The task is to get to level 20 in D&D by sunset. They fail and are now broke. While Big Brother cuts the housemates from all news from the outside world and limit them to what they can get up to. The GD Studio Lounge is the complete opposite. People are free to come and go and allowed access to news, video games, music and more via iPads, phones, PC, laptops and consoles. It may seem obvious but its a lot more interesting to watch people when they aren’t completely bored out of their head even with the danger of that happening anyway. It is also more interesting to watch people when you have seem them do other stuff in the past like Celebrity Big Brother. 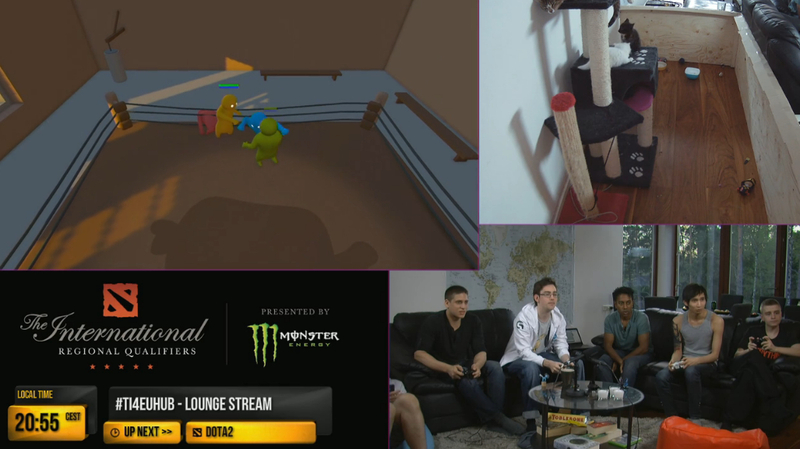 For example its interesting to watch Dota 2 players Weh Sing ‘SingSing’ Yuen and Johan ‘N0tail’ Sundstein play the PC game Gang Beasts like a bunch of over hyper children. Day #53: Pro gamers show the secret to their success… smashing all the buttons. 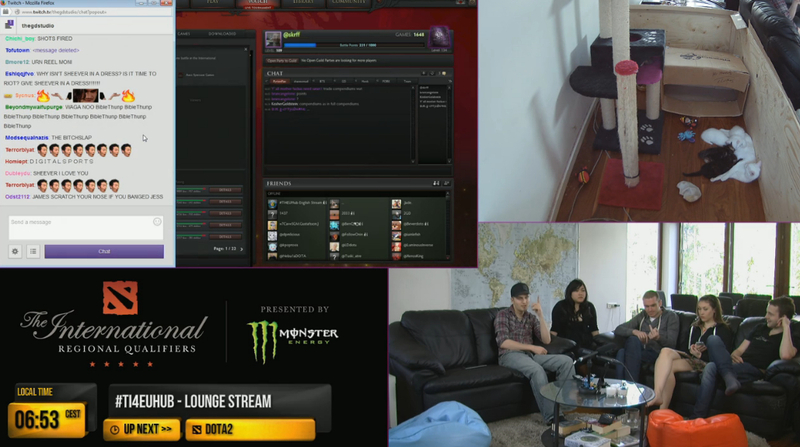 In the Lounge Stream they play a lot of emulators such as Arcade, Nintendo 64 and Game Cube ones. Which I feel is kind of odd for them to blatantly play these games without any pretence of owning any of the games. They have a PC with access to Steam but they spend more time playing Nintendo 64 roms such as the various Mario Party games. I am not complaining that they are playing to many console games it just feels wrong to watch people play pirated games while the show gets money from the audience and their sponsors, Monster Energy Drink. 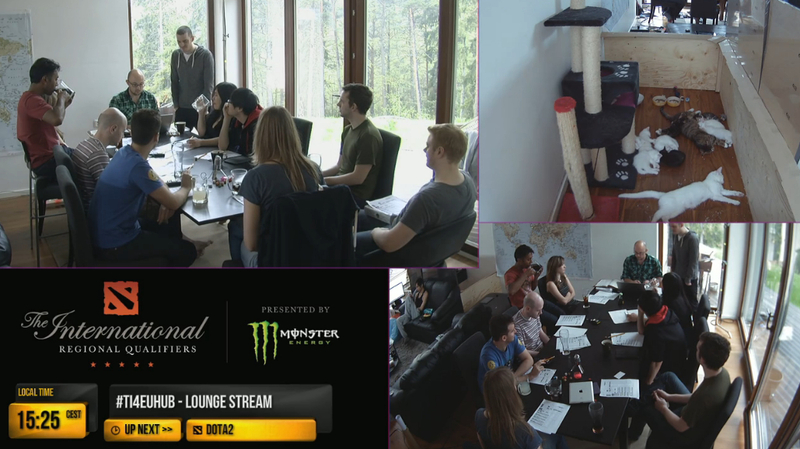 Anyway if you want to see interesting people like Andy ‘Draskyl’ Stiles, Toby ‘Tobiwan’ Dawson, Jorien ‘Sheever’ Van Der Heijden, Ted ‘Pyrion’ Forsyth, Bruno ‘Bruno’ Carlucci, James ‘2GD’ Harding, Jess ‘Ruckus’ Brohard and some Dota 2 players like Clement ‘Puppey’ Ivanov playing bootleg Nintendo 64 games or playing Dungeons & Dragons then the GD Studio’s EU Hub Lounge Stream is some good viewing. I wouldn’t read the chat or watch it for long periods though but Big Brother could learn a few things from the GD Studio, minus the obnoxious viewer chat obviously. Day #79: Sheever and Ruckus are still hounded while Bruno looks favourite to win GD. Its worth mentioning they have tons of kittens and two female adult cats in a little walled area which in itself is basically a show within a show or house within a house. I think the kittens can be adopted too so that’s cool. The EU Hub also provide some of the best Dota 2 commentary in my opinion so that’s a bonus as matches sound better when Tobiwan is commenting. Big Brother instead of cutting people from the outside world should just give people activities and equipment that they would normally have access to and take part in. This will make the show more interesting and more enjoyable for everyone involved. Note: With the International 2014 European Qualifiers ending tomorrow the live streaming will likely stop too. However you can always watch previous recordings or highlights on their Twitch channel. You could also just wait until next time the GD Studio do their own brand of esports Big Brother. The GD Studio Twitch channel: http://www.twitch.tv/thegdstudio. The EU Hub Twitch channel: http://www.twitch.tv/euhub. My Opinion: State of Decay is Now Available on Xbox 360. Also Eleven Screenshots, Videos, Update 1 and More. My Opinion: Everything You Need to Know About the Xbox One. My Thoughts on Sony, Microsoft and Much More. My Opinion: Everything You Need to Know About the PlayStation 4 and Much More.